To experience the group exhibition Measured Response, curated by Emily McDaniel and now on view at NAS Gallery, is to become decidedly aware of your own body in space. At one point I stand in the middle of a series of works that are taller than my 6ft frame: Lorraine Connelly-Northey’s ‘Possum skin cloak’ (2018), ‘Narrbang 2-12’ (2018), and ‘Kooliman (Coolamon) with digging stick’ (2018) are all made of recycled material—corrugated iron, chicken wire, barbwire, and sheets of aluminium—but here such material has been repurposed to create traditional Waradgerie cultural objects. 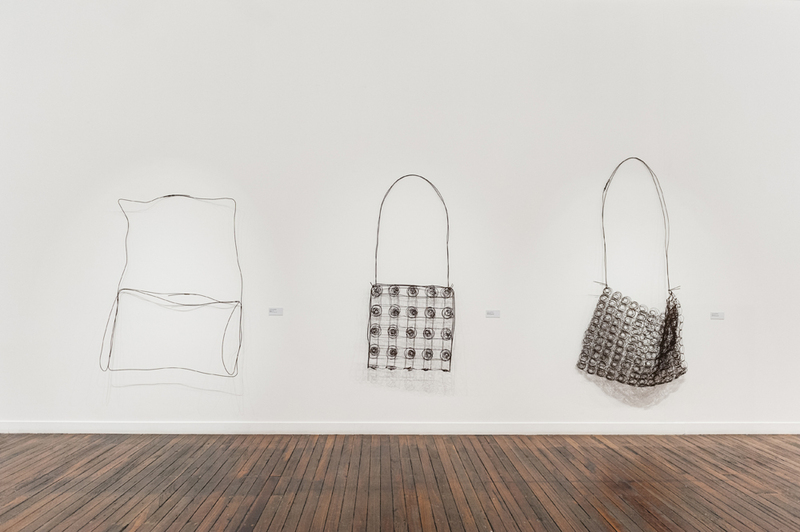 There’s a delicacy to these works, a lightness in the forms of the bags and carriers, despite the harshness of the metal. And when presented as such imposingly large objects, the works also act as place makers for our own steps when walking around the exhibition—we are invited to consider our own bodies and movements amongst these woven forms. 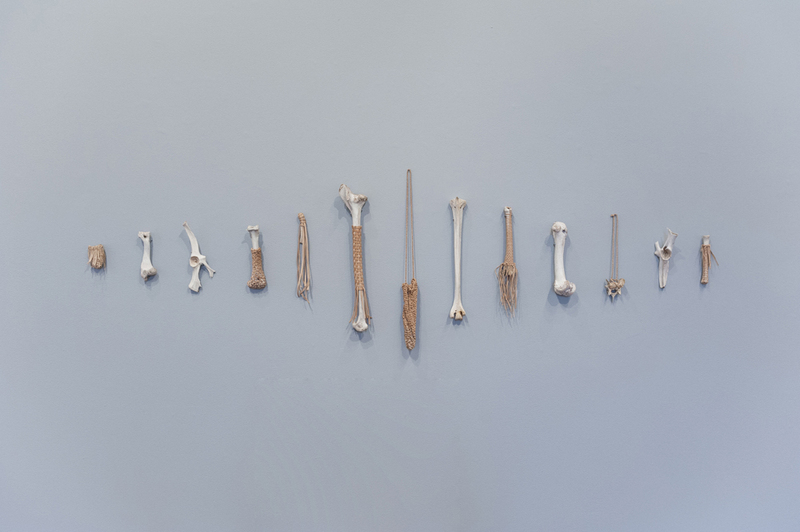 For Measured Response, McDaniel has brought together the work of an extensive number of Indigenous artists and collectives who engage with the bodily and spiritual practices of artmaking. It is the artist’s body and its relationship to the materiality of the work that lies at the heart of the exhibition, with each artist imprinting or embedding some form of trace within the art object. As McDaniel suggests, ‘whether the artist is breathing glass into form or impressing fingertips into earthly clay, each of these artworks are profoundly personal, representing a deeper knowing and ancestral memory.’ Whilst Measured Response showcases the talents of Indigenous women and collectives as a whole, it also reveals the differences in their practices: each artist has their own distinctive skill and craft to explore, and through this they are able to bring attention to their own specific political and social concerns. Because as much as the exhibition showcases such personal responses to materiality, the work also becomes a weapon for decolonising the false narratives that underpin Australia’s history. It is an approach that gains particular significance when considering the way in which Indigenous culture is often publicly celebrated by political figures—such as during the most recent NAIDOC week, themed ‘because of her, we can’—at the same time as questions surrounding sovereignty, the legacies of colonisation and ongoing injustices remain unanswered. In highlighting the history and practices of traditional methods of artmaking, and their relationship to knowledge and community, Measured Response also actively usurps Western hierarchies of genre and the mysterious power of the singular artistic ‘genius’. This is particularly the case for works by Euraba Artists and Papermakers and Hands On Wagga Weavers—both collectives that build on communal practice and cross-generational engagement—as well as the work of Gorawarl, Jerrawongarla artist Julie Freeman. ‘It’s not me that’s using the hands, I’m just the instrument’, states Freeman when describing the process of constructing Grandmother Basket (2005) and Granddaughter Basket (2005)—‘you carry everybody in yourself, you are everyone you’ve ever been.’ Indeed, this exhibition also adds an additional layer of dialogue and exchange in placing such works in conversation with one another, as personal responses to craft-making practice then become part of the larger project of retaining cultural tradition. Overall Measured Response is both celebratory and thoughtful in its consideration of ‘bodily presence’, and for me, its curatorial framework is at its most successful when the relationship between artist and work has been expanded outside the purely tactile. It is in doing so that Measured Response allows for a consideration of the political ramifications facing the world’s oldest living culture, and the way in which contemporary artists are undertaking the necessary task of remembering and reclaiming the deep knowledge of country.